There is nothing in this film that will cure cancer…solve world hunger…bring about world peace. But it can make you laugh and isn’t that always a step in the right direction? I’d like to formally apologize to those who had to be in the same theater with me while I was watching it; I like to laugh and this did it for me, big time. The odd part was there was a disproportionate amount of older people in the theater, as in well over 60, even 70 and they were laughing, a lot. Sadly they also talk a lot during movies and tend to do so loudly. ‘What’s that, what did he say? Did he say Stephen Foster? Didn’t he do a lot of songs in our day?’ Geez, how old were those people? But they did laugh hardest at the naughtier parts. Cool. Seth MacFarlane is a savant with voice work, really, a wonder to listen to. I find him hilarious, twisted, conscientious, brilliant, creative, cute as a button, although arguably not an actor with a wide range, but who knows what the future brings. I think surrounding yourself with talent like Neil Patrick Harris, Charlize Theron, Liam Neeson, Giovanni Ribisi, Sarah Silverman, Amanda Seyfried, Rex Linn, etc. helps in some respects, but also shines a spotlight. 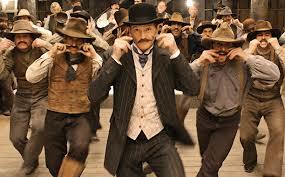 Yet for me, MacFarlane‘s enthusiasm for his subject matter and his stunning comedic skills override any drawbacks. 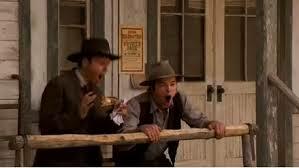 Obviously meant to pay homage to old Westerns and Blazing Saddles and just as unrealistic. Where Brooks trail-blazed, MacFarlane and fellow writers Alec Sulkin and Wellesley Wild have to do some rehash slinging slashing. You’d think relentlessly infantile would get old yet, no, fresh as a well-placed daisy. And Brooks was doing all this before MacFarlane and friends were even born…I think this will one day be seen as a classic. As for the bored part, look what we have and people still say they’re bored. I guess life isn’t necessarily better, just different. Too many funny moments without reciting the whole movie which sadly I can probably do. As with all MacFarlane works there were some messages hidden among the endlessly silly filth. Don’t keep chasing someone who doesn’t love you for you. Relationships should be reciprocal. Brains can win the day. So can poison. And it’s our expectations of any time or place that shape our enjoyment, for however long we have. I love the anachronisms and the contemporary feel of this, it adds layers to an already riotously rootin’ tootin’ good time. See if you can pick out Ryan Reynolds and Jamie Foxx in their brief, but overtly shining moments in ye olde limelight. 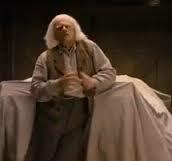 And Christopher Lloyd was pure Christopher Lloyd – Great Scot! Patrick Stewart voicing the sheep was hilarious. What a trip! I think I’ll have the Moustache song in my head forever, gee, thanks. Even catchier than A Million Ways To Die by Alan Jackson and that’s sayin’ somethin’. Even as it was ending I was thinking, again! again! I’d heard this should be a good film for a laugh, now it sounds like it definitely needs to go onto my “to watch” list! 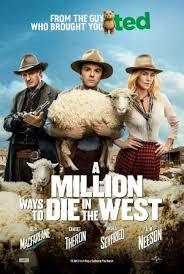 1…2…A Million Ways To Die In The West – This sounds like an excellent movie, that many adults find it as a laugh. It sounds like a movie that I have to watch. Thanks Donna. I should look for this one. The best medicine… Hugs. Watched that Nasty Girl Gif for two hours, waiting for her bold self to take it all off. Nothing happening. I’ll try again tomorrow. Hope the week ahead treats you kindly.